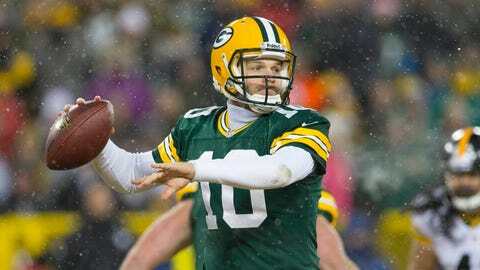 In five games with the Packers this season, Matt Flynn completed 102 of 166 passes for 1,146 yards with seven touchdowns and four interceptions. Q: Paul – do you think Matt Flynn has done enough to yet again capture some interest from other teams as a starter next year? Quality QB’s are hard to find and I’m worried he has. I say worried because it would be a relief to sign him long term as Rodgers back up and finally eliminate the drama next preseason..if he is willing to take that role. Not to mention we could save a draft pick and concentrate our early round picks on a safety, tight end and pass rushing linebacker. A: No, I don’t think there will be any interest in Matt Flynn in the free-agent market to potentially be a team’s starting quarterback next season. Every team in the NFL had a couple opportunities to sign him this season to a minimum contract. When the Buffalo Bills signed him, they had him in for three weeks and then cut him loose. Flynn remained a free agent for another week, garnering no attention whatsoever until the Packers called to give him a workout in mid-November. What Flynn did for Green Bay this season, including a 2-2 record as a starter, was more than what could have been expected of him under the circumstances. But is that suddenly going to change the league-wide perception of him from being a weak-armed quarterback who wasn’t even worth a workout to now being a starting-caliber QB? I doubt it. As Flynn’s stops in Seattle, Oakland and Buffalo perhaps prove, for whatever reason, he just plays well in a Packers uniform and that’s it. Whether it’s Mike McCarthy’s offense, being comfortable in the organization that drafted him or some other factor, Flynn likely realizes that Green Bay is the right spot for him. And I bet the rest of the league thinks that, too. Whether the Packers are convinced that Flynn should be Aaron Rodgers’ backup for the next five or so years and lock him into a contract, I’m not sure. It would save them a draft pick, but McCarthy and general manager Ted Thompson will have to be absolutely certain that Flynn can maintain this level of performance long-term, because they’ve seen how quickly a team can go from 5-2 to 7-7-1 if the backup QB position isn’t set. Q: Paul, I think the Dom Capers bashing isn’t altogether accurate, but I do have one issue. It seems like the philosophy is "this is our scheme, and we shoehorn the players into it as best we can" instead of "let’s adapt the scheme to suit the talents of our players." Is this an accurate observation? A: Yeah, I think that is an accurate observation. It wouldn’t make sense for the Packers to draft a player who they think is best suited for a 4-3 defense. Nick Perry thought before the 2012 draft that he was probably more likely to excel in a 4-3, but Green Bay disagreed and brought him into its 3-4 system. The Packers liked Datone Jones a lot because they saw him play in a nearly identical defense at UCLA. If Green Bay ran a different defense, Jones might not have been such an intriguing prospect for this franchise. As defensive lineman B.J. Raji recently said, defensive coordinator Dom Capers has been doing this for a long time, longer than most of his players have been alive. The players understand that Capers isn’t going to suddenly change his scheme. I think the "this is our scheme; we shoehorn the players into it as best we can" (in your words, Lou) can work just fine. But when the defense struggles as it has this season, it puts the philosophy, the coordinator and the players all in question. Q: What do you see as the packers number one pick in the next draft position wise? 1. Safety — As I wrote at the time, this position should have been addressed in the 2013 draft when safeties like Matt Elam, Kenny Vaccaro, Eric Reid and Johnathan Cyprien all had first-round talent. In 2014, there aren’t nearly as many quality safety prospects, but if the Packers could get their hands on Alabama’s Ha Ha Clinton-Dix, Green Bay’s defense would be instantly improved. 2. Tight end — With Jermichael Finley’s future uncertain (plus, he’s a free agent), I don’t think the Packers’ starting tight end in 2014 is currently on their roster. Andrew Quarless, Brandon Bostick, Ryan Taylor and Jake Stoneburner are nice pieces to the puzzle, but they’re not enough of a receiving threat to give Aaron Rodgers the type of middle-of-the-field presence that the offense needs to thrive. North Carolina’s Eric Ebron and Washington’s Austin Seferian-Jenkins are two names to keep an eye on. 3. Inside linebacker — There needs to be an upgrade at inside linebacker sooner than later. A.J. Hawk (age 30 next season) and Brad Jones (age 28 next season) would be better suited in complementary roles rather than as the two starters in a defense that expects them to make a lot of plays. Alabama’s C.J. Mosley is a top prospect who likely won’t be on the board beyond the 10th pick, and then there’s a fairly big drop-off before the next group of inside linebackers with second- or third-round talent. 4. Wide receiver — James Jones is a free agent this offseason, and while I think he’ll re-sign with the Packers, he’ll also be 30 years old next season and will eventually decline in production. Jordy Nelson will be 29 next season, and for as good as Randall Cobb is, his 5-foot-10 frame means he needs taller receivers around him. Jarrett Boykin will likely be around Green Bay as a nice piece for a long time, but he’s not likely to ever be a star in the NFL. If the Packers don’t get the pass-catching tight end they want, I think adding a young, top-tier receiver prospect in the early rounds of the draft could really benefit Rodgers and the offense. With the top two receivers in this draft class, Clemson’s Sammy Watkin and USC’s Marqise Lee, likely gone before it’s Green Bay’s turn to select, there’s a large group of receivers who will battle to be late-first and early-second round picks. Q: Don’t you think the players and coaching staff should be held accountable when they have obviously failed to perform on an NFL level? This is the first time in the long Green Bay Packer history that they may go an entire year without a safety making an interception, this has not happened in the 50’s, 60’s, 70’s, 80’s, 90’s, or in the new millenium (in other words since the end of players playing both ways). In Charlie Peprah’s last season he had 5 picks and then was basically run out of town for ineptitude. Not only have they not made a pick but they have as much trouble making a tackle, terrible mechanics are a way of life when they try to tackle. Not only do they need to replace both the starting safeties but they need to show Darren Perry the safeties coach the door as well â he has to be accountable for a complete failure at the positions he coaches â he is responsible for putting the players in position to intercept and tackle. A: The safety play for the Packers this season has not been good. Morgan Burnett has not lived up to his big, new contract and M.D. Jennings should not be a starter in the NFL. If the talent isn’t there, is it fair to really blame position coach Darren Perry? At that particular position, I think it’s on Thompson for not providing Green Bay’s defense with starting-caliber safeties. I think there is accountability, though. Jerron McMillian found that out this season when the Packers released him. It isn’t like Green Bay to give up on a player who was just a fourth-round pick in 2012. That sent a message to other players that if they don’t perform, they could be gone. McCarthy preaches accountability, and when it’s not there from players, different results can come about. Look at what Jeremy Ross is doing for the Detroit Lions and it’s easy to think that the Packers jumped the gun on releasing him because of a few costly errors. McMillian hasn’t signed with another team yet, and it’s possible that his NFL career is over at the age of 24. I think, all things considered, Green Bay has put its roster moves where its mouth is this season in terms of accountability when performance isn’t up to the level that it needs to be.